New Occasions and Sale-a-bration Time! What new besides the New Year? Here is a brief overview of what the New Occassions Catalog has to offer! the BRAND NEW 2017 Stampin' Up! 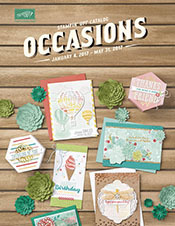 Occasions Catalog!! There are SO many fun things in this catalog! You’ll find supplies and ideas for birthdays, Valentine’s Day, babies, Easter, Mother’s Day, Father’s Day and more. Be sure to watch for Bundles to save 10% on coordinating items like the Balloon Adventures stamp set and Balloon Pop-Up Thinlits Dies on the bottom of page 4. It’s the Best Time to Earn FREE Stamps & Accessories! 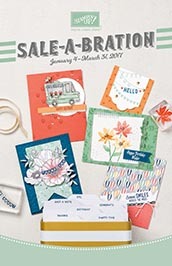 A $100+ order will get you 2 free Sale-A-Bration products, a $150+ order will get you 3 free Sale-A-Bration products PLUS free Stampin’ Rewards of at least $15 to spend on whatever you’d like, etc. There is no limit to the number of freebies you can get! Question about anything you see in the catalogs? Just leave a comment or email me and I'm happy to help.